Greetings from beautiful Jackson Hole, Wyoming! On Tuesday morning I had the pleasure of attending the Tory Burch SS 17 Show where I wore this pajama matching suit. I attended the Tory Burch show at 9am, took my suitcsases with me, changed in the cab to a more causal outfit after the show and went straight to the airport. After attending NYFW for several days I can say that the Tory Burch Show was by far my favorite show. No one really does summer like Tory Burch; I saw a beautiful combination of prints, elegant summer pieces, bright colors and fun earrings. I look forward to styling some of the pieces I saw in the near future. I was a bit hesitant to wear this pajama suit but I figured if I wanted to try a different trend what better place to do so than NYFW? 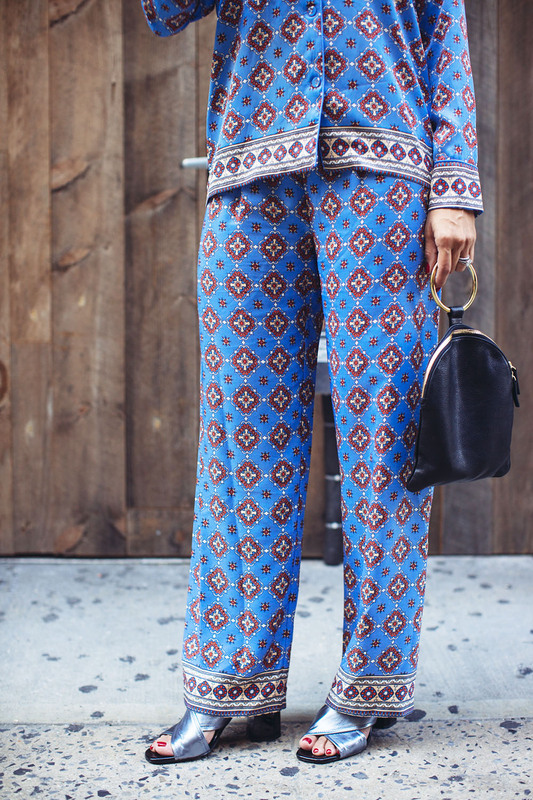 I love the tile print on this outfit, the soft material and overall relaxed look. These pants are high-rise and stretch at the waist which make them extremely comfortable. The key to this trend is to style up, for example adding a pair of heels as seen above for a more elegant touch or bold colored lipstick. I also love this blue pajama suit and this high-end version pink pajama suit. The post Pajama Suit appeared first on Chic Flavours.